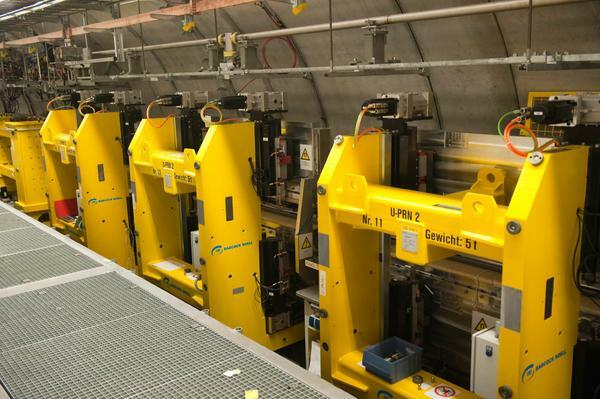 Researchers from the University of Hamburg and DESY for the first time have operated DESY´s free-electron laser FLASH in direct seeding mode. By overlapping short, extreme ultraviolet laser pulses with the ultra-relativistic electron bunches in their experimental setup called sFLASH, the team improved the pulse properties in intensity and length compared to unseeded FEL flashes. The method allows to create fully coherent electromagnetic radiation with high intensities and short wavelength, as now reported by a team around Jörg Rossbach and Markus Drescher from the University of Hamburg in Physical Review Letters (DOI: 10.1103/PhysRevLett.111.114801). “This technology allows us to generate not only “laser-like” but real laser radiation in the extreme ultraviolet wavelength range with all its benefits for investigation of ultra-fast phenomena in, e.g., molecular dynamics,” notes co-author Tim Laarmann of DESY´s X-ray Femtochemistry research team. The sFLASH undulators in FLASH. Since about ten years researchers make use of the intense extreme ultraviolet (EUV) and soft X-ray radiation from free-electron lasers (FEL) for a variety of experiments and investigations which were not possible before. The FEL radiation is created by a strongly compressed ultra-relativistic electron bunch sent through powerful magnets, the undulators, which force the electrons on a slalom course. Here, the electrons radiate spontaneous undulator light, which self-triggers an exponential gain process of the light. This so-called “Self-Amplified Spontaneous Emission2 (SASE) has already a lot of advantages compared to spontaneous undulator radiation, but it suffers from poor longitudinal coherence. Many experiments would dramatically profit if they could use fully coherent radiation. That is why accelerator researchers around the world are developing new schemes to improve the properties of FEL radiation for users. At FLASH, the researchers have set up an experiment (sFLASH, for seeded FLASH) where they could send low intensity, but fully coherent EUV laser pulses (the so-called seed pulses) into the undulator simultaneously to the electron beam. By the interaction of the external laser field of these seed pulses with the electrons within an undulator structure it is possible to initiate, or “seed”, the FEL process and by that amplify the fully coherent pulses by several orders of magnitude in pulse energy. The challenge for this is, to hit the short electron bunches with the even shorter EUV laser pulses. “We are talking about pulse durations shorter than 50 femtoseconds. Traveling at the speed of light this corresponds to a length shorter than the thickness of a human hair,” says Jörn Bödewadt. To get these pulses into overlap, sophisticated diagnostics is needed in order to be able to measure and control the beam position and the arrival time of both beams. The EUV seed beam is generated by means of nonlinear frequency up-conversion of near-infrared (NIR) laser pulses in rare gases, so-called high-harmonic generation (HHG): By focusing NIR laser pulse into a noble gas, like Argon in our case, it is possible to create light at much shorter wavelength. 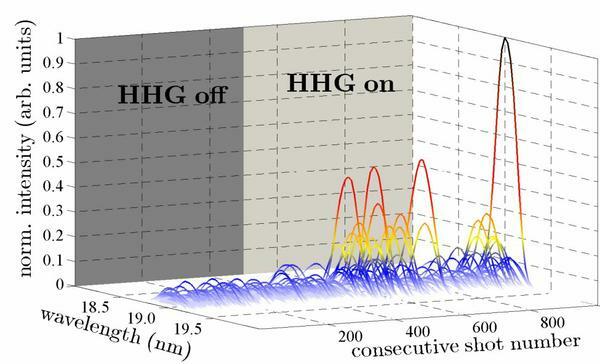 For sFLASH, an HHG source has been developed which delivers fully coherent laser pulses at a wavelength of 38 nanometres. The first installation for the seeding setup in the FLASH tunnel in 2009/2010, the researchers commissioned the setup and improved some of the sub-systems in order to transport sufficient pulse energy into the seeding undulator. They were able to observe the first seeded FEL signal which has set a new world record in the shortest wavelength ever used for directly seeded FELs. In addition to that, the pulses used for seeding as well as the electron bunches were about one order of magnitude shorter than what has been used in previous experiments in other facilities around the world. After optimization of the seeding process a significant enhancement of the FEL pulse energy due to seeding has been observed. Since the seed pulses are much shorter than the electron pulses the power contrast is expected to be even stronger. In spectral measurements of the second FEL harmonic at 19 nm the power between seeded and unseeded FEL radiation differed by a factor of 36. In the future, the team will improve the FEL diagnostics in a way that allows characterizing coherence and synchronization of the seeded light directly in the time domain of the FEL pulses. This would allow demonstrating to what extend the seed pulse properties are preserved by the FEL amplification process. The plot for experts: When seed pulse and electron bunch match (right), the light intensity of the FEL pulse increases by a factor of up to 36.